3 Bedroom Detached House For Sale in Warminster for Guide Price £425,000. 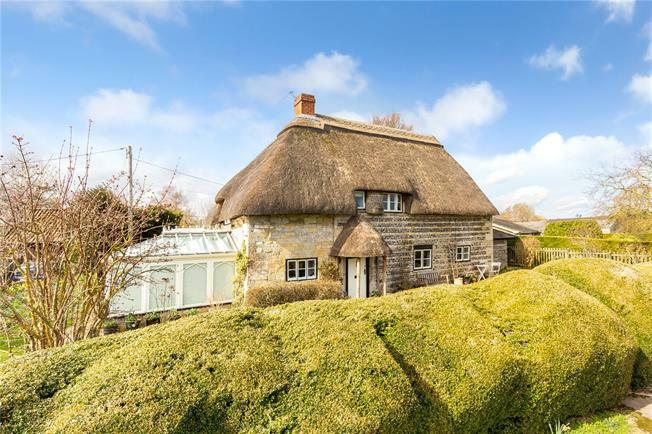 The village of Wylye is famous for its pretty thatched cottages, with this Grade II-listed detached property serving as a prime example of the local architecture. Believed to date back to the early 1600s, the cottage retains a wealth of period features including a traditional banded flint and limestone front elevation, vast inglenook fireplace with wood-burning stove, bread oven and exposed beams throughout. The property is entered via the spacious sitting/dining room, extending to 22ft, with an open staircase rising to the first floor. This double aspect room has windows onto both the front and rear gardens and leads to the utility room/cloakroom and bedroom three (currently used as a study) to one side, and to the other opens to the kitchen. The latter is appointed in a traditional style with tiled floors and worktops and is fitted with a selection of wall and base units for storage. The kitchen opens onto the good-size conservatory with double French doors leading to the terrace and stunning gardens. On the first floor there are two bedrooms, including a double bedroom with a cloakroom and a master bedroom with an en-suite bathroom, feature fireplace with blocked out chimney and delightful views over the farmland to the front of the property. The pretty conservation village of Wylye is situated in the Cranborne Chase AONB. The village is well positioned for exploring the attractive countryside of the Wylye Valley, with its many rural pursuits including walking, riding and traditional field sports. The village itself is home to shop/Post Office, church, village hall and well-regarded pub, The Bell, while further amenities can be found at Codford (4 miles) including a supermarket, garage and health services. Transport links are good being close to the A36/A303 junction with access to other local towns and the M3 motorway. Mainline rail services run from Warminster to London Waterloo with more regular services from Westbury (Paddington) and Salisbury (Waterloo). The property is situated off the no-through road of Sheepwash Lane with a footpath leading to the centre of the village. A driveway to one side of the house offers off-street parking for multiple vehicles and in turn provides access to the detached double garage. The front garden is laid to lawn and secluded from the road via a landscaped hedge, with a charming pedestrian path running from the front door and planted on either side with mature flowerbeds. The west-facing gardens wrap around the conservatory where there is a sunny paved patio affording a pleasant outdoor dining space. Keen gardeners will appreciate the established planting throughout, with additional features including a pond and a variety of trees and shrubs. In addition to the gardens, the vendors also rent a further area of garden from Wiltshire Council which they use as a productive vegetable garden. Wiltshire Council will negotiate a new lease if the purchaser so wishes.